Located on the western side of the Czech Republic, Marienbad is described as the most beautiful place on earth. This view is endorsed by the Friends of Malvern Springs and Wells during their numerous study tours to the resort and one that earns it a place as one of the Seven Wonders of the Springs and Wells World. What makes it special is that it has retained the Victorian elegance of architecture and gardens that has largely disappeared or been adulterated with modern developments and congestion in so many other towns and cities in Europe. 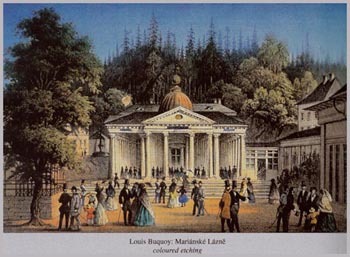 The fame of Marienbad was founded primarily on its mineral waters. In the uptown spa area there are about 40 springs that yield a wide variety of mineralised waters, and there are another 100 in the surrounding countryside. All the waters are cool with temperatures between 7' and 10' C. They are naturally acidulous with a high level of carbon dioxide, and many are rich with iron. This variation in chemical composition impacts on their use for a range of medical conditions, either by inhalation, imbibing or mineral water bathing. The most celebrated include the Cross spring, the Ferdinand spring, the Rudolph spring, the Marie spring, the Forest spring and the Ambrose spring. The mineral waters have gained a substantial reputation over many years when used for drinking, baths and other spa cures. The resort became one of the leading world spas in the latter part of the 19th century when it was patronised by the rich and famous including royalty. The principal architecture dates from that era and on a sunny day can only be described as wonderland, with its fairy palaces and musical fountain. 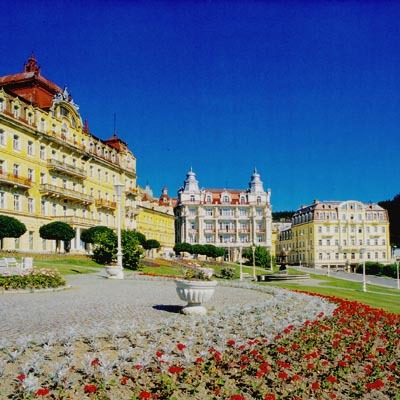 The tradition of healing with water continues and Marienbad is a thriving tourist resort. More details of this stunning resort can be seen by clicking on Website below. Malvern Civic Society has orchestrated a town twinning with Marienbad and details of this will be added to this web site from time to time. Learn about the Singing Fountain and the Malvern Civic Society trip to Marienbad by clicking below.